Hello Frndzzz.... www.dealsnloot.com Back With New Freecharge 100 Cashback Coupon Offer. Freecharge offering Prepaid Mobile Recharge Rs.30 cashback on Rs.10, Rs.50 cashback on Rs.50 and Rs. 100 cashback on Rs. 100 recharge. It works only for new users. Not valid for Airtel Users. 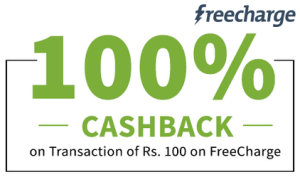 ° Once your coupon is applied successfully then complete the transaction, you will get the Cashback of Rs 100 will be added to your FreeCharge account within 24 hours. 1. Offer valid till 31st October 2015. 2. Offer valid only for New users of FreeCharge (on first transaction on FreeCharge only) & Offer valid only if the Promocode FCLINE100 is used before the transaction is completed. 4. Offer not valid on Airtel (Prepaid/Postpaid/ DTH ) transactions. 7. Line freecharge Offer valid only on Credit card, Debit card. Offer not valid on transactions via Netbanking and FreeCharge Balance / Wallet. 8. Line FreeCharge Offer not valid on add cash transactions. 9. Promotional cash back is valid for 6 months only and cannot not be refunded to bank. 10. Promotional cashback will be credited in form of vouchers to the wallet. 11. Cashback will be credited to FreeCharge Wallet within 24 hours. 12. FreeCharge reserves the right to modify / revoke the offer without any prior notice.